All images via ACT Responsible . Like it or not, we’re bombarded with advertisements from companies encouraging us to purchase the latest and greatest products they have to offer each and everyday. Slick magazine ads and TV commercials feature great photography, memorable taglines, models and more to lead us into temptation. More recently, some of that advertising space has been filled with a different kind of message created by ad agencies who’ve teamed up with environmental groups, government and others to ask us to buy into something else: the protection of the planet. Whether or not you think these ads make us think and act differently, one thing’s for sure – it’s nice to see some socially responsible ads out there! Read on, and you’ll discover 20 awesomely creative environmental ads from around the world. To see larger resolution images, click on the campaign name link or name of the ad. Tagline: We are drowning. Rescue us from global warming. A powerful ad showing that rising sea levels directly impact humans. The companion ad in this campaign depicts an island in the shape of a hand, slowly being overtaken by the sea. A familiar style of Chinese painting called “Shan Shui” – literally “mountain-water” – where artists depict spectacular natural vistas for viewers’ admiration is updated for the reality of the 21st century; a closer inspection of Industrial Revolution reveals “mountains” of high-rise buildings, endless hydro towers and a set of highways. The set of three ads also includes beautiful “paintings” of Global Warming andAutomotive Pollution. Tagline: Be the root. Nature in the city begins with all of us. The harder you try, the more it will thrive. We need your help. Putting down your roots has new meaning in this ad that urges us to bring nature back to the city. A catchy tune and colourful graphics makes this a memorable ad for the MTV generation. Tagline: When you leave the light on, you are not the only one who pays. This is a cool series of three ads where nature’s flora and fauna are represented in wallpaper you might find in a child’s bedroom. Ice features cute polar bears and penguins floating on small ice floes. Dolphin is one of six print ads in the 2009 Veolia Environnement campaign. All feature aerial views of sprawling cities with a strategically placed animal or plant image embedded in the city-scape to create a thought-provoking series of ads. Tagline: On average 50 to 100 feet of beach is lost for every foot of sea-level rise. How long before land disappears all together? You decide. Help stop global warming. Produced in the Unite Arab Emirates. This picture, called Sand Specimen, shows a little bit of sand stored in a jar, and reminds us of those old museum specimens of extinct species. Tagline: The world needs more trees. Look closely and you’ll see that each inch of the tree trunk is covered in koala bears: it’s the only tree they can find! Tagline: The air cooling your home is heating the world. Agency: Beijing Dentsu Advertising Co., Ltd.
Our furry friends have been pushed to the brink of a cliff (read: extinction) in the war between animals and the machines (powered by us humans) in this ad, called City Again Forest. The text in the 2nd screen in The dying screensaver ad says, “Beauty doesn’t last forever. Only 30% of the red coral sea reef is still alive. Please help protect it. www.redsearescue.org” It’s an interesting take on those pretty desktop aquariums that pop up when computers are left idle; imagine if that aquarium imitated what was really happening in the real world? It wouldn’t be a pretty sight. Tagline: Our water is thirsty. Instead of green roofs, here’s a cracked, dry land called Agbar desert sitting atop an urban landscape. It’s not a nice sight at all. Tagline: Resources. Tips. Debates. Live Green at Toronto. The City of Toronto’s Live Green Toronto program is a five-year, $20-million initiative that aims to promote and support actions at the local level to reduce emissions, clean the air and protect the climate. Represented by the Treebike here, the program includes community animators who help people find information, link them to environmental groups and cash in on rebates – all to reach Toronto’s target of an 80 per cent reduction in greenhouse gas emissions by 2050. A pretty neat ad that brings the message home about the impact that printing reams of paper has on the African forest. This side-by-side comparison of a colourful sea and murky waters packs a real punch. In Bomb, an image of a tree in the shape of a mushroom cloud sends a powerful message about the consequences of cutting it down. A small family of penguins stand on a shrinking Iceberg candle. Sadly, they’ve got no place to go. Tagline: Travelling fruits cause pollution. Moral of the Story: Be thankful for what you have.. Be creative. Be innovative. Think differently and positively. When life gives you a 100 reasons to cry, show life that you have 1000 reasons to smile Face your past without regret. Handle your present with confidence. Prepare for the future without fear.Keep the faith and drop the fear. And even more beautiful is, knowing that you are the reason behind it!!! 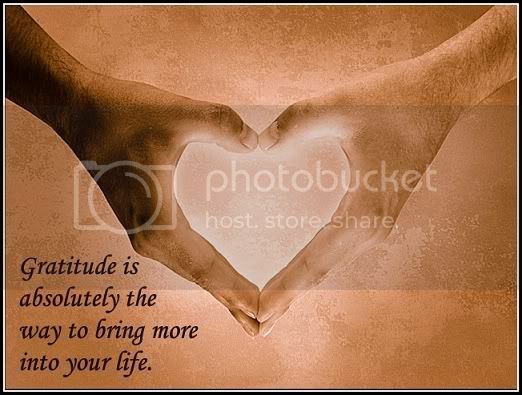 Enjoy your day with a heart of gratitude. Pecha Kucha Night was devised in 2003 by Astrid Klein and Mark Dytham of Tokyo’s Klein-Dytham Architecture (KDa), as a way to attract people to Super Deluxe, their experimental event space in Roppongi. Pecha Kucha Night events consist of around a dozen presentations, each presenter having 20 slides, each shown for 20 seconds. Each presenter has just 6 minutes 40 seconds to explain their ideas before the next presenter takes the stage. Conceived as a venue through which young designers could meet, show their work, exchange ideas, and network, the format keeps presentations concise, fast-paced and entertaining. In 2004 PKN began running in a few cities in Europe, and has since spread virally since has become a worldwide phenomenon, now running in more than 260 cities in almost every corner of the globe. 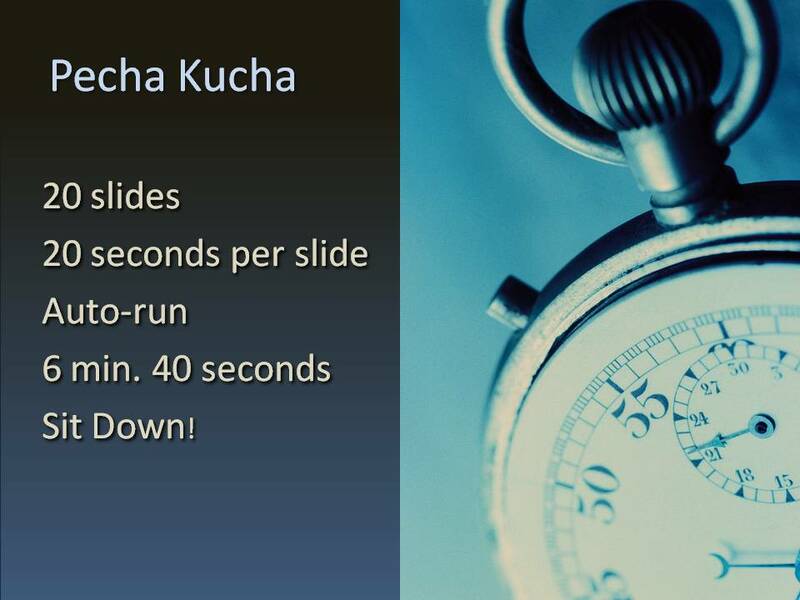 A typical Pecha Kucha Night includes eight to fourteen presentations. The presenters (and much of the audience) are usually from the design, architecture, photography, art and creative fields, but also often includes those from academia and the business world. One of the attractions of Pecha Kucha Nights is the wide range of the presentations. Most consist of design professionals showing their creative work, but presenters often speak about such topics as their travels, research projects, student projects, hobbies, collections, or other interests. Organizers is some cities have added their own variations to the format. Variants include Pecha Kucha mash-ups with other Japanese pop-culture contributions: Pecha Kucha karaoke (creating a narrative of someone else’s slide show) and Pecha Kucha Iron Chef (dueling presenters competing for audience appreciation). In Pune, the first PKN was held on October 23’09 and had 90 people in attendance. Twelve individuals from the fields of dance, journalism, architecture, fine arts, poetry and literature met at well-known architect Christopher Charles Benninger’s office. The presentations included a slide show on the evolution of a chair by senior architect Shrikant Nivasarkar, Falguni Gokhale’s journey as an artist; Varsha Gavandi’s interesting facts on Chinese gardens and demonstrations on the finer nuances of classical dance by Kathak dancers Kaveri Agashe and Sheetal Kolwalkar. Many years ago, a large American shoe manufacturer sent two sales reps out to different parts of the Australian outback to see if they could drum up some business among the aborigines. Some time later, the company received telegrams from both agents.